Murumuru Butter is pressed from the reddish-orange fruits of the Astrocaryum murumuru tree. This tall palm tree is native to Brazil and other regions of the Amazon. MuruMuru Butter is full of essential fatty acids and Pro-Vitamin A. This butter is solid at room temperature but melts on contact with skin. What Are The Benefits Of MuruMuru Butter? 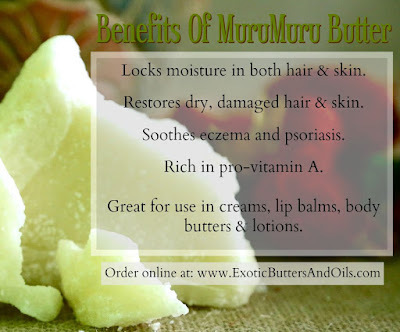 MuruMuru butter is known to be a super emollient. Absolutely wonderful for conditioning dry, brittle, damaged hair. Creates a permeable barrier that is said to prevent moisture loss when applied to wet hair while keeping hair soft and pliable. MuruMuru butter's unique composition of essential fatty acids and Pro-Vitamin A help restore elasticity to damaged and aging skin. This butter is soothing to dry and cracked skin and those suffering from eczema and psoriasis. Hair: Because of it's great ability to help retain moisture, MuruMuru butter is best applied to wet hair, allowing hair to stay moisturized longer. Great for use as a sealant after applying leave in conditioner. Skin: Rub a small amount in the palms of hands to melt and apply all over skin paying close attention to problem areas. Best if used directly out of the shower on slightly damp skin to help lock in moisture. In Cosmetic Products: Great for use in lip balms, creams, and lotions for hair and skin products.